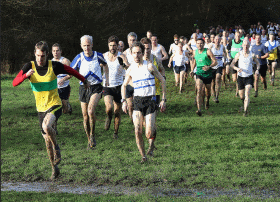 There were many commendable aspects of Halstead’s organisation of the xc relays at Gosfield on Saturday – two examples being, an excellent ‘real’ xc course and a very good spectator-friendly finish area.... and of course the weather was perfect. There were some obvious issues which the Endurance Committee and the Executive Committee are already reviewing in order that we can make suggestions, or provide solutions, to future race organisers. Both Committees sincerely apologise to any team members who experienced a less than satisfactory event. Honestly, we really understand your frustrations. Putting on any event is a challenge and with a record entry this year, Halstead’s efforts to cope with this deserves our respect and thanks. 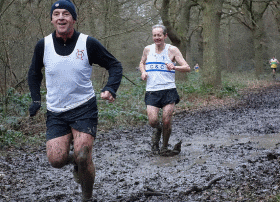 A proper cross-country' This is what many runners were overheard saying after Saturday's race. 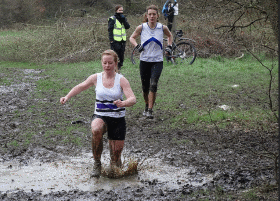 With mud, hills and drizzle which eventually turned to rain, Hilly Fields was the ideal setting for the Essex U13/U15/Vets Champs, hosted this year by Colchester Harriers. 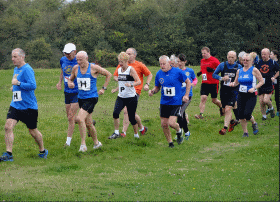 Just shy of a record entry, there was a fantastic 75% attendance which made for some great racing over all age groups. This year we introduced chip-timing and weather proof numbers which were put to the test in the damp conditions. Mike the Whistle started proceedings at 10am with the U13 boys race. The tightest of finishes saw Will Steadman pip Henry Dover to win gold, closely followed by Luca McGrath. The U13 girls race was equally well fought but a good finish secured gold for Abigail Reid, followed in by Kiera Atkinson and Kezia Beeton. 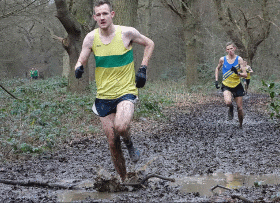 Results from previous XC championship events can be found here. Recent results of championship races are here.